For everyone with paternal Y-DNA and/or maternal mtDNA from Alpine Area. As of June 2018 there is no more FamilyFinder (autosomal and X-DNA) research; previously kits with min. 1/4 of the ancestry (one grandparent) could join. The Public Alpine DNA Gedmatch Kits List form (see participants spreadsheet) will kept online as long as believed to be useful for shared public research. 1.1 public results (Y, mt): public viewing and sharing of Y and mt groupings is essential for successful research. On Privacy & Sharing > Project Sharing > Group Project Profile have "Opt in to Sharing" active. Public Family Tree Sharing and mt Coding Region Sharing is also helpful. In Project Preferences > Advanced or at least Limited Group Project Administrator Access is necessary for effective Y and mt research. 1.2 Y-DNA (research focus): Genealogical evidence of paternal lineage ancestry or clear Y-DNA match/es from the Alpine Area. Member of the most informative Y-Haplogroup project/s. 1.3 mtDNA: Genealogical evidence of maternal lineage ancestry or clear FMS match/es from the Alpine Area. Member of the most informative mt-Haplogroup project/s. FMS submission to Genbank. Y-DNA research and grouping: The goal is to find clusters with Common Ancestor (see also MRCA) not more then 1,000 years ago. Haplogroup predictions can be higly speculative and can only be made if a 37/67 marker profile is in the group and Matches are publicly available. Please correct errors and send additional information. For fine-grained clustering and optimal paternal discoveries we use the following Projects for your (alpine) Y-DNA Haplogroup: R1b (U152, U106), I1-NCE / I1-M253, E1b-M35 (M2), J (J1/J2), R1a-M198 (R1a-Y), G, I2a-P37.2/I2b-M223/I2b-L38, L, T, Q. For more Haplogroup Projects login to myFTDNA and look here: E (4), G (3), I (11), J (17), L (4), Q (2), R (37), T (2). 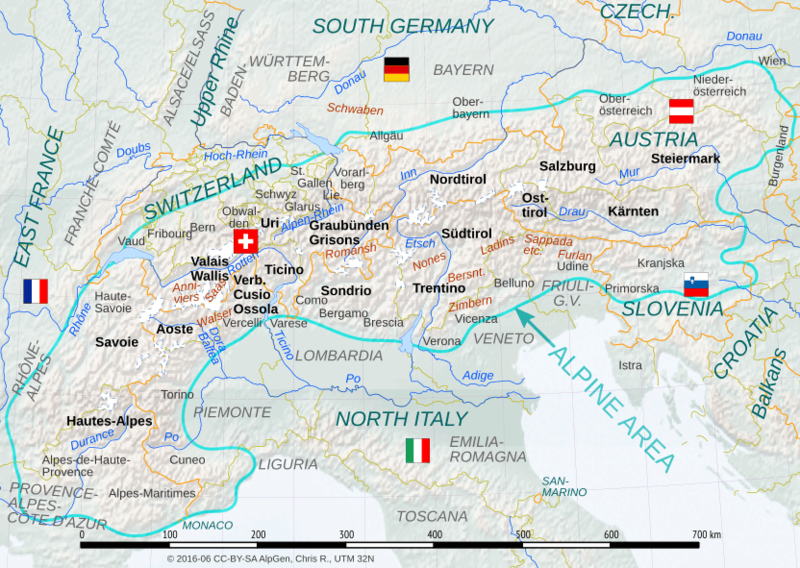 For FTDNA customers with paternal (Y-DNA) and/or maternal (mtDNA) and/or autosomal DNA ancestry (by genealogy) from the Alps: the european mountain valleys stretching from Austria (Österreich) and Slovenia (Slovenija) in the east through Italy (Italia), Switzerland (Schweiz - Suisse - Svizzera - Svizra), Liechtenstein, Germany (Deutschland), France and Monaco in the west. Core Alpine DNA places: Tyrol (Nordtirol, Osttirol), South Tyrol (Südtirol - Alto Adige), Trentino (Welschtirol), Salzburg, Carinthia (Kärnten - Koroška - Koruška), Styria (Steiermark - Štajerska - Stájerország), Graubünden (Grischun - Grisons - Grigioni), Sondrio (Sunder - Sünders), Ticino (Tessin), Uri, Valais (Wallis), Verbano-Cusio-Ossola, Aosta (Aoste - Outa), Savoie (Savouè d’Avâl - Savoia), Hautes-Alpes (Auts Aups). Rhaeto-Romance minorities (language, old culture): Romansh, Ladins, Furlan. Candidates: Nones/Solandro. German minorities: Cimbrian (Upper German - Bavarian dialect)/Zimbern/Cimbri in Trentino, Verona, Vicenza, Belluno (Lusern, Roana, Seven Communities, Giazza/Glietzen,...); Bersntolar/Mócheno (Tyrolean dialect) in Trentino; Walser (Highest Alemannic) in Northwest Italy, Italian Carnian Isolates: Plodn/Sappada, Zahre/Sauris, Tischlbong/Timau, Kanaltal/Val Canale. Interesting population history: Saas Valley (isolated alemann settlers? ), Anniviers (Hungarian roots? ), Valdôtains (border situation, Arpitan in Italy). Alpine Diaspora: Puerto Tirol (Argentina), Colonia Tirol (Brazil), Tirol (Romania), Villa General Belgrano (Brazil), Oxapampa (Peru), Swabian (South German) emigration to Transylvania/Siebenbürgen - see Danube Swabians. Joining other relevant geographical projects is very useful: Switzerland, French Swiss, North Italy, Ladinia, Slovenia, Friuli Venezia Giulia, German Language area, Italy. Baumgartner different Haplogroups with origins in Switzerland, Austria and Germany. Bertschinger R1b incl. Persinger from USA. Origins in Eastern Switzerland / Graubünden? Holiger Y-DNA J2a-L25 incl. Hullinger from USA with ancestor Henri Holiger of Boniswyl, Aargau, Switzerland, born in 1425. Rottensteiner Y-DNA. Rottensteiner from Tyrol, Salzburg, Lower Austria. Oldest line arround 1530 in South Tyrol. Zelger Y-DNA. L-M317 Zelger from Tyrol, Switzerland, USA. TiGen - Tyrol Genealogy partly in english. Tyrolean DNA admixture and genetic structure. South Tyrol (Südtirol - Alto Adige): population, ethnic groups and historical migrations. Swiss Anabaptist DNA Project and Anabaptist Family Finder Project auDNA comparison for Anabaptists groups like the Amish, Mennonites, River Brethren and Hutterites.